Lighting up the pre-dawn Kazakhstan sky, a Russian Soyuz rocket carrying a veteran cosmonaut and two NASA astronauts roared to life and vaulted into orbit Tuesday, kicking off a two-day flight to the International Space Station. Station veteran Fyodor Yurchikhin and NASA astronauts Douglas Wheelock, a shuttle veteran, and rookie flight engineer Shannon Walker lifted off aboard the Soyuz TMA-19 spacecraft at 5:35:19 p.m. EDT (3:35:19 a.m. Wednesday local time) from Yuri Gagarin's launch pad at the Baikonur Cosmodrome in Kazakhstan. 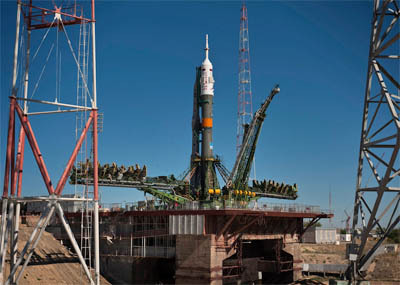 If all goes well, Yurchikhin and Walker will oversee an automated approach to the International Space Station, docking at the Zvezda command module's aft port around 6:25 p.m. EDT (2225 GMT) Thursday.